Hoover Institution economist, Eric Hanushek, is one of the chief think tank hacks for corporate education reform and the testing-industrial complex. His work consistently reminds us of the definition of "ecomomist" as "an expert who will know tomorrow why the things he predicted yesterday did not happen today." As a perfect example of this characterization, Hanushek much prefers to use empirical data to speculate his way toward a shared acceptance of his plutocratic patrons' preconceived notions by building a statistical house of cards inside a hypothesized future that we can only appreciate in the end for its entertainment value, rather than its factual veracity. 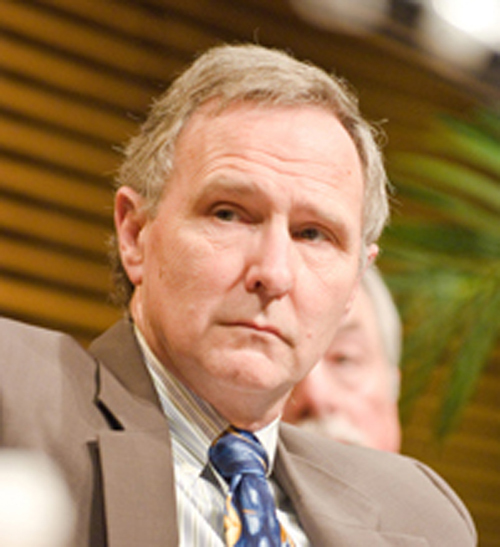 Often, right wing pundit Eric Hanushek (above) is reported to be at "Stanford University," when in fact he is at the Hoover Institute, a different entity housed at Stanford. For example, econometric fantasizing has come to be Hanushek's stock-in-trade, as is evidenced in a number of Hanushek's recent non-peer reviewed "working papers." In a recent one that was picked up and reprinted as if it had been published in a peer-reviewed journal, Hanushek claims that "replacing the bottom 5-8 percent of teachers with average teachers could move the U.S. near the top of international math and science rankings with a present value of $100 trillion." This past Monday [November 20, 2011], Harvard's edu-biz magazine, Education Next, published Hanushek's latest attack piece on the National Research Council's "Incentives and Test-Based Accountability in Education," a report released last spring with the results of a 9-year investigation into the effectiveness, or lack thereof, of high-stakes tests in U. S. schools for raising student achievement. -- Some incentives hold teachers or students accountable, while others affect whole schools. School-level incentives like those used in No Child Left Behind produce some of the larger achievement gains, the report says, but even these have an effect size of only around .08 standard deviations — the equivalent of moving a student currently performing at the 50th percentile to the 53rd percentile. For comparison, raising student performance in the U.S. to the level of the highest-performing nations would require a gain equivalent to a student climbing from the 50th to the 84th percentile (NRC Press Release). -- the use of high school exit exams decreases the high school graduation rate without increasing achievement (PDF Summary). Since few read Harvard's Education Next outside the corporate foundations and think tanks, the oligarchs' media men pitched the Hanushek retread story to one of those rare paid reporters from Huffington Post, whose work load obviously demands stories more numerous than they are researched. The result is an uninformed and fawning gloss that leaves unchallenged Hanushek's right-wing misinformation. The question of the effects of testing has long plagued education. Few dispute the need to have some way to take stock of what students learn from their teachers. But critics assert that an emphasis on test-related incentives, such as grades for students and grade-based funding for schools, has tamped down on creativity in the classroom, treating kids like identical items on an assembly line — without the product. My dear overworked HuffPo reporter, it is not "the question of the effects of testing that has long plagued education," as you write in your piece. It is the effects of testing, themselves, that have long plagued education, especially since the inception of NCLB and its fanciful testing targets that have blown up so many public schools over the past nine years. These negative effects have been documented in a mountain of research and by good reporting over the past decade. As a place to begin, I highly recommend Tested . . . by reporter, Linda Perlstein. And criticism of the current testing mania is not aimed at criticizing the grading of students, as you clearly suggest. Rather, the criticism stems from the counterproductive use a single test of questionable quality to determine the futures of children and their teachers and their schools. The 112-page-long NRC study came at a critical point during the NCLB discussion — and it read as a manifesto against the use of testing as a tool to promote learning, Hanushek claims. Please! A manifesto sets out a platform, a direction, an agenda, a strategy, etc. The NRC Report is anything but a manifesto, and it does not read like one, as Hanushek would have you, dear HuffPo reporter, believe. In fact, one of Hanushek's criticisms in the Education Next piece is that the NRC Report lacks specificity in its recommendations, something never missing in a manifesto. The NRC Report, rather, is the result of a 9-year empirical research study by a group of scholars that the mainstream Education Week called a "veritable who's who of national experts in education law, economics and sciences." Notably, it does not include Eric Hanushek. Importantly, the NRC Report does not compare effectiveness of NCLB to some other testing universe with low stakes, as the following quote from the HuffPo piece indicates. This is not only misleading — it is dead wrong. "Test-based incentive programs, as designed and implemented in the programs that have been carefully studied, have not increased student achievement enough to bring the United States close to the levels of the highest achieving countries." This is where taking time to read the NRC Report would have been very helpful in reporting on someone else's version of what the Report said. "Hanushek, an economist, claims that the .08 standard deviation increase in student learning is not as insignificant as the report makes it sound. According to his calculations, the benefits of such gains outweigh the costs: that amount of learning, he claims, translates to a value of $14 trillion. He notes that if testing is expanded at the expense of $100 per student, the rate of return on that investment is 9,189 percent. Hanushek criticized the report for not giving enough attention to the benefits NCLB provided disadvantaged students." "The report, Hanushek said, hid that evidence..."
In the very next paragraph, however, HuffPo quotes Hanushek as saying that his wild claim was, indeed, noted in the Report, even though Hanushek clearly believes that his speculations should be regarded as empirical data that the NRC should have highlighted. 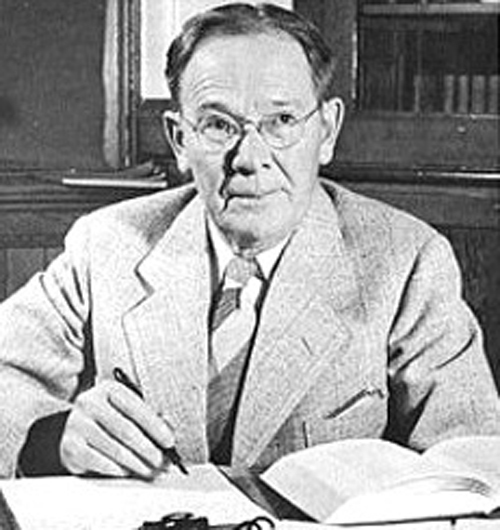 Of all the right-wing professors of the 20th Century, few did more damage to democracy than Lewis Terman (above), who pioneered the biased "IQ tests" that became the "scientific basis" of the eugenics movements of the 1920s and 1930s among academics and capitalist intellectuals (and others, including Henry Ford and many anti-Semites) during the years of the last iteration of "Race To The Top" (which ended temporarily with the defeat of the Axis in 1945). This kind of extrapolated nonsense reminds me of another testing guru from a hundred years ago, eugenicist and IQ test promoter, Lewis Terman. Terman, too, was an accomplished propagandist, and he got great reception in the mass media by coming up with IQ test scores out of thin air for historical figures, everyone from J. S. Bach to George Washington and Abraham Lincoln. While pulling numbers like this out of your, um, hat makes for great parlor entertainment, no one should take these speculations seriously. Pure hokum, but no less so than Hanushek's econometric hyperbole of $14 trillion or $100 trillion in added value for some, otherwise, worthless test scores. Finally, HuffPo obviously follows Hanushek's advice and spends the last five four paragraphs documenting the opinions of Paul Hill, one of the NRC panelists whose livelihood is tied directly to the good will and open checkbook of the Gates Foundation. It would seem that the current mission by the Business Roundtable and the education industry to slime the NRC Report requires the public bad-mouthing even by those panelists who are willing, if their best financial interests require them to do so. Hill said he was slightly concerned with the report itself, and that its tone was a product of a committee comprised of experts with mixed views on testing. "It said that test-based accountability alone won't raise achievement," he said. "I believe that. Test-based accountability, though, with reasonable supplementary policies … is a good idea." The apparent anti-testing bias, Hill said, came from those on the committee with backgrounds in education. Yes, of course, those ax-grinding educational researchers whose 3 members on the NRC Panel overpowered the other 14 members to hijack a report that would have otherwise presented the worldview of the next generation of testers and tabulators, those visionaries who live for the end of the achievement gap and by its non-arrival.